With production starting this summer in Australia on Warner Bros.' Aquaman, the supporting cast is now starting to come together. A recent video even revealed that Jason Momoa has begun his stunt training for this superhero adventure. The story is still being kept under wraps, though, with very little revealed about this stand alone film. Over the weekend, director James Wan answered a few fan questions through social media, confirming that the DC Comics character Aqualad will not be a part of this movie. Last night, one fan asked director James Wan on Twitter if he's looking for an actor to play Aqualad. The director's response was swift and merciless, saying that he is, "Absolutely not at all" looking to cast someone as Aqualad. This confirmation upset some fans, with one even going so far as to claim that the exclusion of Aqualad "crushed" his dreams. The director responded by joking that Batman should be established before Robin is thrown into the universe, essentially stating that he wants to make sure Aquaman is properly established before a sidekick is introduced. Aqualad was introduced in the DC animated series Young Justice, with the character created by Greg Weisman, Brandon Vietti and Phil Bourassa, with Khary Payton (The Walking Dead) voicing the character on the animated series. Aqualad was so popular on the series that DC brought him into the comics, with Geoff Johns and Ivan Reis creating this version of the character named Jackson Hyde, making his comics debut in Brightest Day #4, which was published in August 2010. While he did gain a certain level of popularity on the Young Justice series, there is likely a good reason why he isn't included in this story. A report surfaced in October 2015 that this new Aquaman movie is inspired by the New 52 reboot comics, but Aqualad wasn't featured in the New 52 reboot. The Jackson Hyde character did return to the DC Comics in DC Rebirth, where he was portrayed as a homosexual teenager, who has a near superhuman talent for swimming. He later joins the Teen Titans when they encounter him while exploring the San Francisco Bay for a mission. 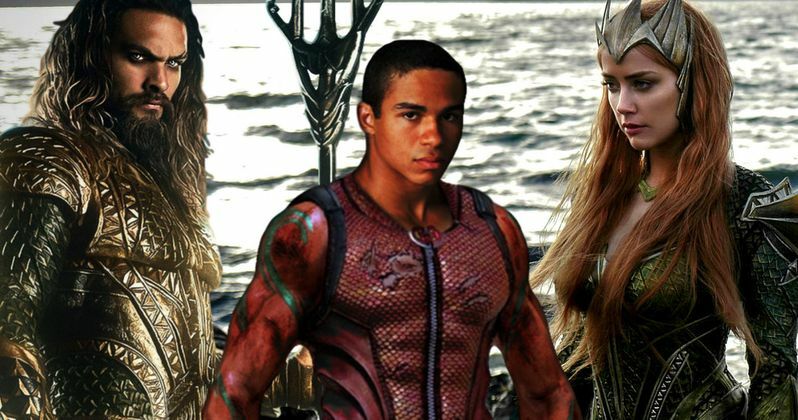 It's certainly possible that Aqualad could surface at some later point in the DCEU once Aquaman has been established, but that's quite a ways down the road from now. Jason Momoa leads a growing cast in Aquaman as Arthur Curry/Aquaman, with Amber Heard as Mera, Willem Dafoe as Nuidis Vulko, Patrick Wilson as Arthur's half-brother Orm, Nicole Kidman as Aquaman's mother Atlanna, Yahya Abdul-Mateen II as the villainous Black Manta and Temuera Morrison as Aquaman's human father, Tom Curry. James Wan directs Aquaman from a script by Will Beall, with Warner Bros. setting an October 5, 2018 release date. As of now, the superhero adventure doesn't have any direct competition, but it does come two weeks before Warner Bros.' Jungle Book: Origins and an untitled Blumhouse horror-thriller. Take a look at these new tweets from Aquaman director James Wan below, where he also confirms that Oscar-nominated cinematographer Don Burgess will be his DP on Aquaman.